Most movement conservatives who saw the Tapper interview were probably astonished at the claim, but Governor Christie soon set things right in his election night victory speech. And chief among Governor Christie’s “many” principles is to look out for number one – Chris Christie. The Jake Tapper interview was quite instructive in how Christie approached his re-election, and it wasn’t to sell conservative policy or governance – it was to sell Chris Christie. Christie seemed obsessed with running up the score against his little known rival, state Senator Barbara Buono, not with building a conservative, or even an establishment Republican base in New Jersey. Election Day, it seems, was all about him. "Christie Whitman was elected twice here and never broke 50 percent. Nobody (no Republican) since 1988 has had a 5 in front of their name in a statewide race," Christie said in the exclusive Election Day interview with Tapper. "My goal always in this race has been to at least get to 50% plus one, and anything above that is gravy and so I'll be really happy with that because that's a historical achievement - in 25 years no one has done that in New Jersey so I'll be happy with that," added Christie. "I suspect we may do better than that." Christie apparently was referring to then Vice President George H.W. Bush, who booked 56% of the vote in New Jersey in his 1988 presidential election victory. The interview with Jake Tapper reminds us of Christie’s keynote speech at the 2012 Republican National Convention. Given a prime time speaking slot at the Convention, presumably to endorse his fellow eastern state Governor and Republican nominee in waiting Mitt Romney, Christie delivered a speech that rivaled a Barack Obama address for the use of the word “I” and managed avoid mentioning Romney until a few paragraphs before the end. Christie’s speech at the Convention also touted his own humble beginnings and rise to the governorship in a way that cast Romney’s silver spoon upbringing in a most unfavorable light, making the speech more of an endorsement of Chris Christie than it was an endorsement of Mitt Romney. Chris Christie may have gotten his wish and broken 50% -- indeed it looks like he coasted to a landslide of around 60% -- but it was hardly a Republican and certainly not a “conservative” victory when all 24 of the Democrats in the New Jersey state Senate were re-elected, even as Christie won his much sought after personal landslide. Submitted by manonmission on Wed, 11/06/2013 - 17:42. Yesterday, I was a candidate for township council on the Christie Line B ticket. While the governor came into our town and took a picture with the entire township team, he was beaten in the town by the Democrat and the entire team lost by a more significant margin. I have been saying that Christie is suffering from a political malady which I call CDS (Coattail Deficit Syndrome)! It may be congenital as it appears that he may have been born without a coattail! I do not blame him for our township team's loss, but he did not pick up a single seat in the State Senate and possibly only one seat in the Assembly. And there was apparently exit polling done somewhere in the State that showed Christie losing by 5-6 points against Hillary Clinton in a 2016 presidential head-to-head! I think his best day politically just happened yesterday. If he gets the presidential nomination, he will not win NJ if the Democratic candidate is Hillary Clinton. Submitted by aarona422 on Thu, 11/07/2013 - 15:08. I never quite thought of Christie's lack of coattails, but it makes sense... he doesn't represent a national movement and is for the most part an anomaly. Submitted by aarona422 on Wed, 11/06/2013 - 16:05. This is probably the shallowest political assessment I've ever made, but I still feel it will effect Christie's ability to sell himself to the public. Basically, he had stomach staple surgery done somewhat recently. It hasn't kicked in yet, but when it does, he's going to lose a lot of weight and have his appearance drastically altered. If he thins out too much, or otherwise has an odd appearance due to the weight loss, his political appeal will vanish. Maybe it won't be a factor, and either way its nothing anybody has any real control over, but it is still worth noting that Christie's weight loss surgery may come back to haunt him. As a final point, I'd like to say that I am not discriminating against him because of his weight or saying him getting that surgery was a bad thing to do for his own personal health. I'm just saying that it occurred and may end up being an X factor in his bid for the Presidency, as it will alter his appearance given time. Submitted by aarona422 on Wed, 11/06/2013 - 15:55. 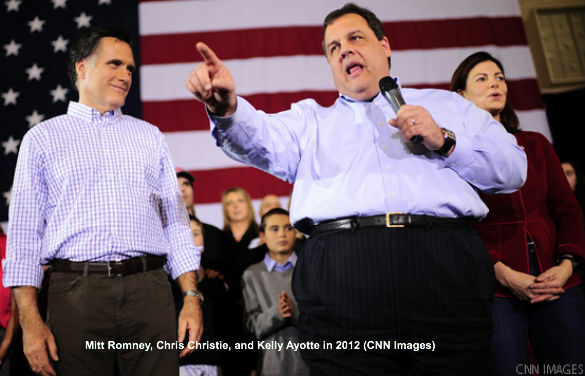 Chris Christie was the first to endorse the Romney campaign so that he could be the last to betray it. An actual Romney Presidency was the last thing he wanted. He is far and away the Establishment GOP's choice for President in 2016. Tea Party beware. On a side note, do you know what Chris Christie, Joe Biden, David Plouffe, and Steve Schmidt all have in common? They are all graduates of the University of Delaware's political science department, although Plouffe left right before graduation to go run a campaign. Christie is all about going after a moderate voting base in a general election. All those U of D guys are. Don't expect conservative principles to be something much valued by Chris Christie. He's no grassroots conservative. Far from it. Submitted by ONTIME on Wed, 11/06/2013 - 14:28. I congratulate Christie for his re election and the defeat of a Deemer, that is in his favor but for him to proclaim he is a conservative and tout that publicly is just a outright farce and another RINO lie.